Review by Gabriel De Marco, Ph.D. Kids, that is, those who are under the age of 18, should be treated more leniently than adults by the criminal justice system. One of Gideon Yaffe's main goals in this book is to offer a rationale for this belief. The claim to be explained is not simply that the state should generally be lenient towards kids, but rather, that the state should be lenient towards all kids. This does not mean that kids should, in every instance, get less severe punishments than adults who, outside of age, are identical to the kids. Leniency can be manifested in various ways; e.g., different limits on the sentences available to the judge, different standards of evidence, different limits on what forms of interrogation are acceptable, etc. Put succinctly, Yaffe's view is that kids deserve a break because they do not have the right to vote. One might, when first encountering this explanation, think that it is mistaken, and obviously so. After all, we already have an explanation for why children should be given a break: they are not as developed as adults are. Because of this, the capacities that ground culpability – for instance, the capacities to recognize and respond to reasons – are possessed by children to a lesser extent. If this is right, then we have reason to think that kids are not as responsible for their actions as adults, and should be treated accordingly. Call explanations that fit this rough description developmental explanations. Yaffe is well aware of such explanations, and mounts an attack on them in the first two chapters. Although developmental explanations are often presented quickly and without much argument, Yaffe takes the first two chapters of the book to develop, carefully distinguish, and critique three precise versions. The result of this discussion is that, as they stand, these three versions of the explanation face significant issues, and rescuing them from Yaffe's objections will require some substantial work if one wishes to explain why all kids deserve a break. To be clear, Yaffe does not deny that differences in psychological features are relevant to assessments of culpability, he simply argues that appealing to these differences will not do the work of showing why all kids, that is, all people under the age of 18, deserve a break. Having shown that the developmental explanations are found wanting, Yaffe goes on to present his own explanation. Fleshing out this explanation allows Yaffe to fulfil the other main goal of this book, which is to provide theories of criminal culpability, desert for wrongdoing, and the sort of participation required to support unmitigated liability for crime. In chapter 3, we get a view of criminal culpability on which culpability is a matter of an action's manifesting imperfect modes of transaction with reasons – i.e., the way in which one recognizes, weighs, and responds to reasons. The more imperfect the modes of transaction manifested, the more culpable one is. Given that legal reasons for refraining from criminal action are weaker for kids (a claim argued for later on in the book), their criminal actions manifest less of a dysfunction in their modes of transaction with reasons. The more elaborate part of this chapter provides an account of the "manifestation" involved, intended to solve the perennial problem of deviant causation in the production of action. On this account, normality and non-deviance are not metaphysical, but rather epistemological features of causation. Although the account of non-deviance provided is an interesting one, many philosophers of action will not find it particularly satisfying, since for many, the assumption that deviance is an epistemological matter and not a metaphysical one will be a non-starter. In chapter 4, we get a view of what it means to deserve one punishment more than another. This chapter is quite abstract and technical at parts, and will require great care from the reader. Yet the result of this investment is rewarding: the groundwork for a theory of deserved punishment; a theory which avoids, as Yaffe puts it, typical characterizations of desert as "mysterious," "primitive, and unenlightened," or "like talk of bad karma" (124). On this account, the punishment one deserves is, at least in part, a function of the degree to which one's transaction with reasons was faulty. Since criminal actions by children manifest less of a fault in their transaction with reasons, they deserve lenience when compared to an otherwise identical adult. There is much to say about the view presented in these two chapters, yet doing so would take quite a bit of nuanced argumentation, a testament to the quality of Yaffe's work. This section will be of interest not only to those working on issues in law and the criminal justice system, but also to many working on moral responsibility and desert, given that the views presented here may shed some light on the moral versions of these concepts. In chapter 5, Yaffe explains which positions he will be taking regarding the nature and weight of legal reasons. Here, Yaffe also argues for the crucial thesis that criminal laws in particular derive some of their strength from the fact that the citizens have a say over these laws. Given that children have less of a say over the criminal law than adults, the reasons provided by these laws are weaker for them. The final piece of the explanatory puzzle appears in chapter 6, where Yaffe gives an account of what it means to have a say, and explains why kids have less of it. To have a say over the law, in the sense that Yaffe uses, is to be legally entitled to exert some influence over the law, along with further entitlements to be free of obstacles from such exertion, and actual freedom from those obstacles. A major such entitlement is the right to vote, and those who are not entitled to vote have less of a say than those who are. Thus, kids have less of a say over the law. This is not to say that those under the voting age have no say over the law, since they are still entitled to exercise their freedom of speech. The point here is simply that kids have less of a say than adults. The final two chapters involve applications of the view. In chapter 7, Yaffe considers other groups of people who may have less of a say; visitors to a country (both legal and illegal), prisoners and felons, and the poor. Chapter 8 discusses the theory in real-life contexts, offering examples of policies in the United States that may already give breaks to children, as well as places where the system may be able to improve. Yaffe's book makes a significant contribution, and is well worth the time spent reading it for those interested in the topic. Given limitations on space, I offer only two comments. First, although Yaffe's view has some independent plausibility, the overall view is intended to gain much of its traction from the claim that it is a better rationale for the policy of giving kids a break than alternative explanations. To keep things simple, I focus on a rival explanation that we can call the simple explanation. On this explanation, kids deserve a break because 1) kids, in general, are less morally blameworthy for their wrongdoings, and 2) degrees of criminal liability should mirror degrees of moral blameworthiness. A typical version of the developmental explanation regarding moral responsibility would give us reason to accept 1, which Yaffe agrees with. Other types of argumentation would be required for 2, yet Yaffe accepts this claim as well (6). In order for this simple explanation to work, we would need to work out various details, perhaps making use of some of the work done by Yaffe in chapters 1 and 2. Nevertheless, Yaffe does consider and respond to this simple explanation, and this description will do for our purposes. Yaffe raises two main worries for the simple explanation. First, it gets the wrong verdict in cases of kids who we have good reason to believe are as developed as a normal adult. Since we have reason to think that these precocious kids are as morally blameworthy as an adult, and criminal liability should mirror moral blameworthiness, they should not get a break. Thus, the view cannot explain why all kids deserve a break, and a view that claims that a precocious child does not deserve a break, in comparison to otherwise identical adults, is "morally intolerable" (183). Call this the problem of precocious kids. The second worry is that the simple explanation does not explain why kids deserve a break when it comes to crimes that are not morally impermissible. I do not delve deeply into the second objection, though it does seem a bit quick. One might think, for instance, that if children tend to be less morally blameworthy because they have less developed capacities to properly transact with moral reasons, this will be relevant when it comes to legal reasons as well, even when those are the only sorts of reasons to refrain from some action. Yaffe's view is meant to avoid these problematic implications, yet it's not clear that it avoids the problem of precocious kids. Suppose that we lower the voting age to, say, 17. In this case, it is not clear how Yaffe's view can account for the claim that we should give a break to precocious kids who are old enough to vote. Yaffe considers an objection similar to this, one which claims that were we to adopt his view, we would have no reason to give breaks to any kids in such contexts. I do not wish to offer this objection. 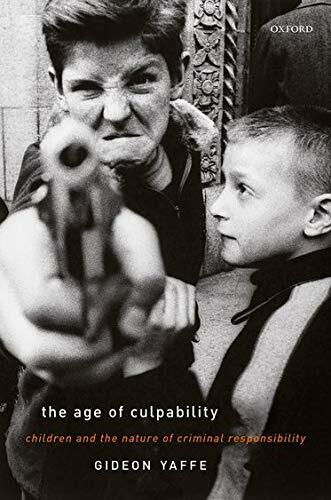 After all, Yaffe is quite careful in elaborating his view, accepting that there are many factors, including developmental ones, that go into determining criminal culpability. In fact, he appeals to such features to show that we would still tend to have reasons to give breaks to kids in such contexts, even on his view. Yet, these sorts of features are not present in cases of precocious kids, a case that Yaffe uses throughout to argue against developmental explanations. On both the simple explanation and on Yaffe's account, we do not seem to have reason to give breaks to precocious kids who are old enough to vote. The "morally intolerable" conclusion is one that both views are committed to, at least for these contexts. Because of this, cases of precocious kids will not do much, if any, work in helping us decide between the views. I do not mean to suggest that this produces a tie between the views; Yaffe raises various objections with developmental explanations. I simply wish to push back on the claim that cases of precocious kids will be much of a deciding factor. Another point concerns the notion of "having a say" employed in this account. Consider the case of Joe and Steve. Joe turned 18 today, and Steve will turn 18 tomorrow. Developmentally, and in terms of knowledge regarding the laws, Steve and Joe are identical. In order to celebrate Joe's birthday, they decide to grab their parents' guns and hold up a liquor store. They are apprehended by the police shortly after their heist. Some might think that it is strange that Steve should get a break, whereas Joe should not, yet this is an implication of Yaffe's view. Of course, when one posits a threshold, cases such as this are bound to arise and present difficulties. Although this may give us some reason to reject a threshold view of giving kids a break, and thus reject the claim that Yaffe's view is intended to explain, it is not clear that this is a very strong reason. I do not offer this as a counterexample to the claim that all kids should get a break. Instead, I use it to apply some pressure on a different part of Yaffe's view. On this view, the strength of a legal reason to refrain from an action is partly a function of the degree to which one is complicit in the law, and one becomes more complicit in a law by having a say over it. As Yaffe puts it, people become complicit in the law "thanks to their real and meaningful opportunity to exert influence over the law, an opportunity provided by the real and meaningful opportunity to vote and to exert influence through speech over those who create the law" (219). The relevant difference between Steve and Joe is not one concerning speech, rather, it is one concerning the right to vote. To avoid one worry, suppose that the last election was yesterday, and the next one will not be for quite a while; long after Steve turns 18. It is true that today, Joe has a general entitlement 'to vote', an entitlement that Steve does not have. Yet, neither Steve nor Joe have the entitlement, nor the opportunity, to 'vote today'. Further, neither of them had the entitlement, or the opportunity, to vote yesterday. Supposing that the next election is November 4, then were he not to have committed the felony, Joe would have been entitled to, and would have had the opportunity to, on Nov. 4, 'vote today.' Yet the same is true of Steve. The only relevant difference between Steve and Joe, it seems, is the general entitlement to vote. It is not at all clear how this difference in entitlement translates to a difference in real and meaningful opportunities to exert influence over the law; and in particular, the laws regarding armed robbery. If the general entitlement to vote is gives Joe significantly more say than Steve, then one might worry about some of the connections made between having a say, in this sense, and complicity in the laws. If, on the other hand, a difference in real and meaningful opportunities to exert influence is what justifies a policy of lenience, then one might think that lenience should extend to those over the age of 18 who have not had any real and meaningful opportunity to vote, like Joe. Although I offer these two critiques of Yaffe's view, I have no doubt that he could produce some ingenious responses. I also have no doubt that debate on the various topics of this book will rage on, significantly further ahead, thanks to Yaffe's book.